This article discusses Anasarca’s definition, symptoms with pictures, causes, and treatment. Its diagnosis is documented under ICD-10 code R60.1 Generalized Edema. Anasarca is not a disease but a warning sign representing an underlying serious derangement. It is a medical condition characterized by the presence of generalized edema. It can cause congestive heart failure, liver failure, renal failure, and severe malnutrition. Anasarca is derived from a Greek word ana means ‘through’ and sarx means ‘flesh’. Anasarca is a generalized edema, is a medical condition that appears in the form of swelling of skin as a result of the accumulation of fluid into extracellular space. 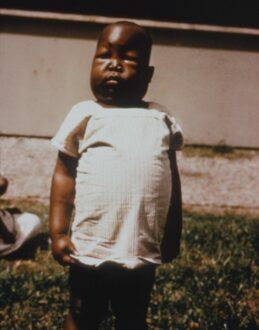 Anasarca may also be called a massive edema or generalized edema. It differs from other conditions that cause swelling and would most likely be isolated to particular parts of the body. It is a type of edema; swelling caused by leakage of cellular fluid, and may vary in intensity. Some patients have only low-level swelling and experience mild pain, while others may be significantly and apparently swollen, with pain caused by the edema. Various conditions may cause edema, some results in localized swelling and other in generalized swelling as in the case of anasarca. Common causes of anasarca comprise organ failure and malnutrition. Cardiac problems with renal failure can cause anasarca. Generalized edema or anasarca occurs kidney failure patients due to loss of protein in the urine. This results in malfunctioning of kidney and causes water and other toxins to be retained in the body. A patient with heart failure experiences poor cardiac function. When a low amount of blood volume is pumped by the heart to other body parts, the kidney sense that there is reduced blood volume in the body. In order to balance the reduced volume, more water and salts are retained thereby resulting in edema. Another condition known as idiopathic edema which cause is unknown is linked with pre-menopausal women and those who took diuretics for a long time. Although diuretics greatly decrease edema through urination, they also cause the problem. It is assumed that in idiopathic edema the fluid passes through the interstitial space pores in the capillaries and thus results in salt and water retention. Salt intake also affects the body resulting in Anasarca. Normally, the salt is well-regulated and is excreted from the body through urine. But in the case of heart or kidney failure, the amount of salt should be reduced to prevent retention of water and to avoid Anasarca. Treatment of generalized edema or anasarca is intended to address the conditions causing the problem. Loop diuretics are given for the excess water to be excreted from the body through urination. This drug stimulates the loop of Henle, a part of the kidney which regulates the salt and water. Congestive heart failure should be treated first to reduce the accumulation of fluids in interstitial space. Generalized edema due to hypothyroidism and protein malabsorption syndromes requires thyroid hormone replacement and identification of the underlying disease process and adequate protein supplementation. Intake of high fiber diet also helps in overcoming generalized edema. Limit fluid intake- this is important for patients with chronic renal failure and congestive heart failure. excessive fluid intake can not only cause edema but it can also lead to breathing difficulty. Parsley is a natural diuretic good for edema treatment. Parsley can be eaten in a large amount or taken as a tea or supplement to flush out the kidneys. Cleavers liquid extract or taken as an infusion work as a diuretic and tonic. Stinging nettle tea is very beneficial herb for the body and supports the internal organs. It also stimulates the kidneys to excrete excess fluid from the body. Dandelion herb is a natural diuretic and tonic to the system. Drinking dandelion tea is useful in treating Anasarca. Rosemary helps to treat bloating. By drinking 3 cups of Rosemary infusion a day treats generalized edema. Anasarca is a potentially disturbing problem for sufferers. It does not only cause an immense amount of discomfort, pain, and other symptoms, it is also quite fatal because of the underlying cause. So it is very important to address the disease or conditions timely to prevent further complications.